Facebook, Google, Twitter, Instagram, and Pinterest have all begun rolling out “buy” buttons over the past year that give users a clickable gateway to make purchases related to whatever they’re viewing at the moment on their devices. Now comes Milwaukee-based advertising and e-commerce technology startup Okanjo, which announced yesterday it has launched a similar product geared toward online publishers, primarily companies that own multiple newspapers. Okanjo says its “buy now” technology makes display advertisements “shoppable.” Consumers see a product they’re interested in, click on a button embedded in the display ad, and complete the purchase right there—without leaving the page of the article they’re reading. The feature is part of a new offering that Okanjo is calling “Product Match,” which can also scan articles on publishers’ websites for keywords, and then place ads next to the most relevant content. The goal is to increase the chances that an ad piques a reader’s interest enough to spur a purchase. The strategy is bearing fruit with early customers, the company says, although it declined to share its revenue numbers. Okanjo’s other products include software that allows publishers to host marketplaces on their websites where local merchants can set up virtual storefronts. The company makes money through subscription fees from licensing its “native commerce marketplace” software to publishers; charging a fee for each merchant that sets up shop on the online marketplaces; and charging advertisers a fee tied to the number of impressions generated by the shoppable display ads, Okanjo marketing director Bethany Grabher says. Okanjo, founded in 2011 by media industry veterans Mike Drescher and Jeff Rowe, started out as an online marketplace where users could sell their stuff and donate a portion of their profits to charity. But within two years, the company switched gears and became an e-commerce technology business. The team realized that “building a destination marketplace is very difficult,” Okanjo chief operating officer Justin Nicols says. However, they believed they had developed a high-quality e-commerce platform and didn’t want to mothball it. The trick was to find a way to “leverage other people’s traffic” and help those website operators find new ways to generate revenue, Nicols says. Online publishers seemed like a “really good fit,” he says. Okanjo arrives at a time when online retailers have started to push sales via transactions that are more tightly integrated with social media, particularly social networks’ mobile apps, to take advantage of where consumers increasingly spend their time when using electronic devices. Retailers run the risk of giving up some of the control over the shopping experience, but it’s a tradeoff that more of them appear willing to take if it means boosted sales. Okanjo, meanwhile, is betting that newspapers’ and other publishers’ websites remain attractive to both local and national advertisers—but they need better e-commerce tools. Okanjo’s leaders think their “plug-and-play” e-commerce products can help by giving advertisers new tools that are more targeted and engaging than typical online display ads, in part because they “promote and sell their products at the moment of impact,” the company says. So far, that’s been “proven in our early customers,” Nicols says, with more consumers clicking on ads that have been strategically paired with related content from publishers. Publishers get new sources of revenue—local merchants pay them a fee to host their online stores, and they can also charge advertisers a premium for the “buy now” button on display ads, Grabher says. Publishers also have less cause to worry about readers clicking away from their sites because transactions can be conducted there, Okanjo says. The benefit for consumers is an “instant shopping experience”—one that Okanjo assures is secure, thanks to measures it says it has built into its software. Okanjo isn’t the first startup to try and get publishers to add new features meant to boost their businesses. Others have had mixed results. Seattle-based entertainment publisher Wetpaint started out selling social technologies to media companies and also licensed its Facebook-focused content distribution system to other publishers; investors took a loss when the company was sold in 2013 to Viggle. Meanwhile, San Francisco-based Stipple raised $10 million to further its technology that layered interactive labels on top of photos posted online, including captions and links to enable online purchases. But Stipple, whose customers included the E.W. Scripps newspaper chain, struggled to turn a profit and shut down last year. One of its competitors, PICT, was acquired in late 2013 by PopSugar, the Wall Street Journal reported. It’s still early for Okanjo, but the company is starting to see some traction. 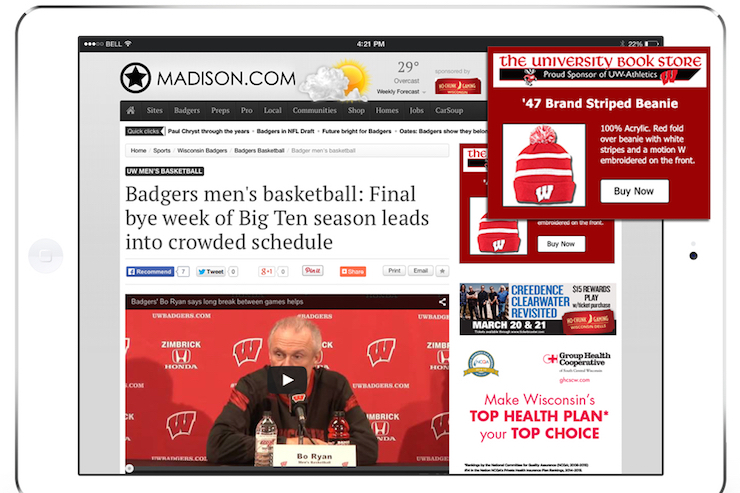 It targeted local publishers first, with early customers like OnMilwaukee.com. It has also signed up Morris Publishing Group, an Augusta, GA-based company that owns 12 daily newspapers, mostly in the South; and Lee Enterprises, whose 50 newspapers nationwide include the Wisconsin State Journal and several others in the Badger State. One of the benefits of Okanjo working with newspaper chains is advertisers can sell ads tailored to local readers in specific markets, and they can also go for “national exposure,” Grabher says. “We do want to empower local media publishers, but what we’re doing is working with larger holding companies so we can scale … to all their properties quickly,” Grabher says. Okanjo has raised $3.2 million from angel investors, including a $1.7 million round in January, Techcrunch reported. The company has 17 full-time employees, although that number no longer includes Brendon Thomas, who until recently was overseeing much of the daily operations as Okanjo’s president. Thomas left the company last month in what Nicols calls a “mutual decision,” and he is now living in the L.A. area and working for Pluto TV, according to Thomas’s LinkedIn profile.